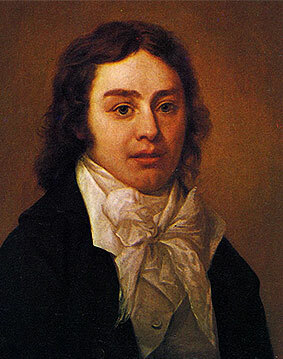 Den ledende romantiske poeten, kritikeren og filosofen Samuel Taylor Coleridge (1772-1834) var en ivrig leser av Swedenborg. Hazlitt dokumenterer at den unge Coleridge «…walked hand in hand with Swedenborg through the pavilions of the New Jerusalem and sang his faith in the promise and in the word in his “Religious Musings». Senere i livet, etter å ha dannet et nært vennskap med swedenborgianeren Charles Augustus Tulk, studerte Coleridge flere av Swedenborgs arbeider inngående. Disse studiene inkluderte The Economy of the Animal Kingdom, The Worship and Love of God, Divine Love and Wisdom og The True Christian Religion. Han tilbød seg å skrive en «Livet til Swedenborgs sjel» for Swedenborg Society, men dette ble det sagt nei til. Han skrev at som moralfilosof er «Swedenborg above all praise; and that as a naturalist, psychologist, and theologian he has strong and varied claims on the gratitude and admiration of the professional and philosophical student«. HJ Jackson: ”Swedenborg’s Meaning is the truth: Coleridge, Tulk, and Swedenborg» i In Search of the Absolute: Essays on Swedenborg and Literature (Swedenborg Society, 2004).